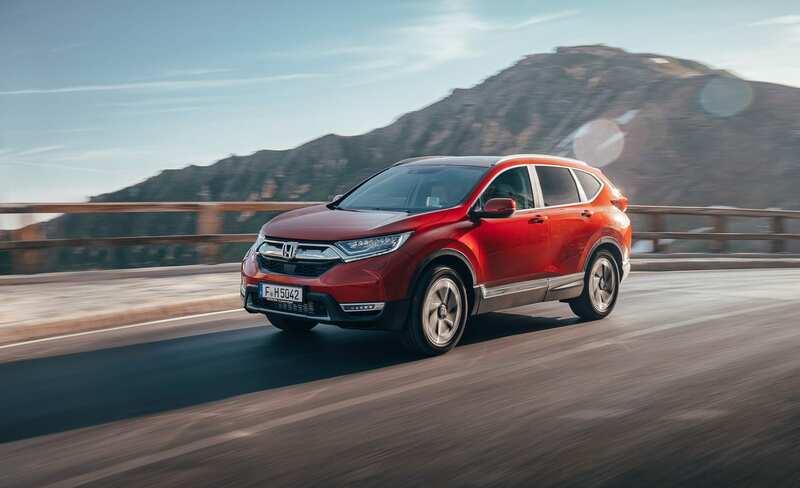 While Iain Robertson has believed for a number of years that Honda is like a spent match, he still hopes that a glimmer of its once accepted brilliance will reappear and it has every risk of that, with a brand-new version of the CR-V model on sale. There is a problem attached to being the founder of any company. When that individual dies, quite often the firm loses its inspiration and its motivation. When you look back through Honda’s amazing history on either two, four, or more wheels, it is one that was shaped entirely by Soichiro Honda (b. 1906; d. 1991). Its diversions into personal mobility, robotics, aeronautics and water-based activities, let alone Honda’s relationship with the UK, were all instigated by its founder. Since Mr Honda’s passing, the company has behaved a little like a rudderless ship. Its misshapen new cars and odd market placements, let alone a failing repute in the motorsports scenes, have been accompanied by awkward marketing, poor public relations management and even faltering product quality. Personally, I find the company’s demise, propped-up almost solely by its world-wide moped sales, to be little more than inexcusable. 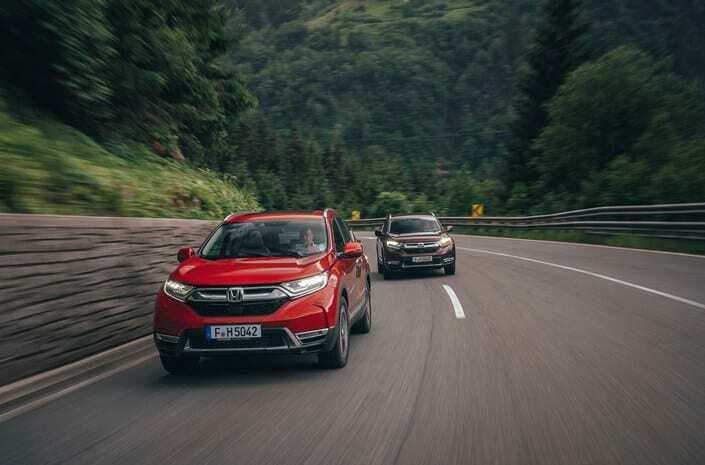 When Honda revealed its first-ever CR-V SUV back in 1995, it grabbed buyers’ attention, with its compact dimensions, yet a raft of residual Honda innovation. Would you believe that, with ‘outdoorsiness’ forming the major aspect of its appeal, opening the side-hinged rear door enabled a shower head to be connected to the spare-wheel’s air supply, so that mud could be removed from boots and, with a privacy curtain erected, salt deposits could be washed from the occupant’s sea-swimming skin? Very thoughtful! Chunky and fun-loving, the front-drive prioritised CR-V was a pace-setter in many ways and, despite its raised height over the conventions of, let’s say, an equivalent Civic model, its dynamic prowess was on a plane expected of a Honda. Fine steering, excellent damping and a firmly sporty ride quality helped hike the Honda to pole position in sales terms. However, it did lack permanent 4WD and, when it did arrive, on subsequent generations of the CR-V, it lacked the technological advancement to allow it to compete head-on with the best in breed. Honda needed to regroup. It needed to benchmark against its bigger rivals. After all, while the HR-V model was introduced as a bit of a side project initially, with humorous intentions, it served as a range-expanding project, satisfying consumer demands for something smaller and sportier in its most recent guises. Honda has worked tirelessly on the latest CR-V. It is bigger. It is roomier. It is more up-market. In fact, it is everything that the critics have been crying out for. 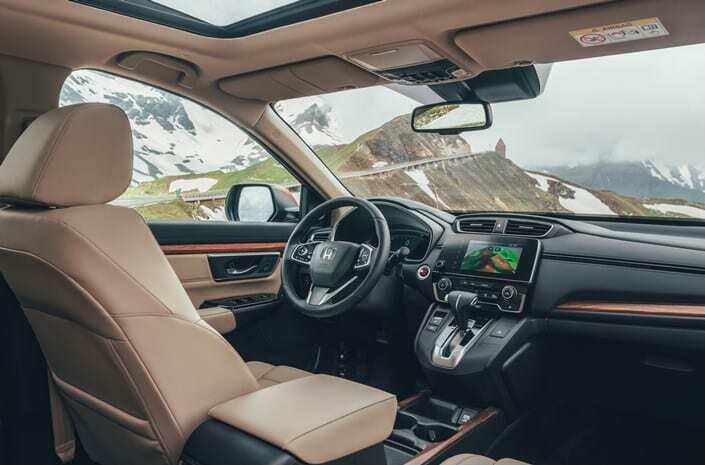 Okay, the seven seats are an option, as they should be, but the investment has been made in core technology, which gifts the CR-V capabilities that none of its forebears carried, even though they hinted at it. 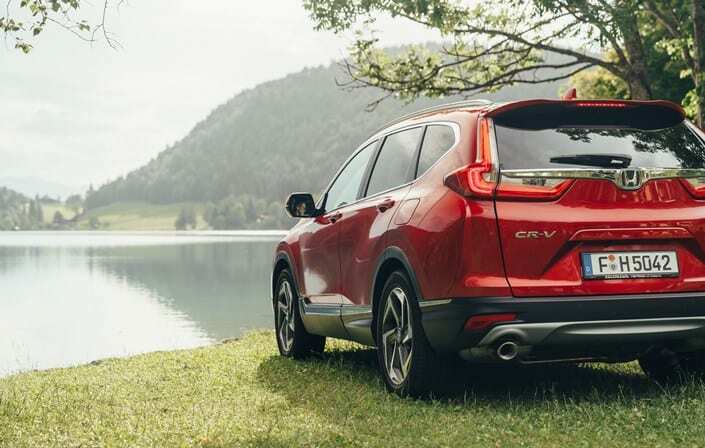 Take the ground clearance beneath the car, which is increased to 191mm, for front-wheel-drive models, and to 201mm for all-wheel-drive versions, which makes them 35mm higher than the previous CR-V. It is a dimension helped partially by the larger-diameter wheel and tyre combinations. 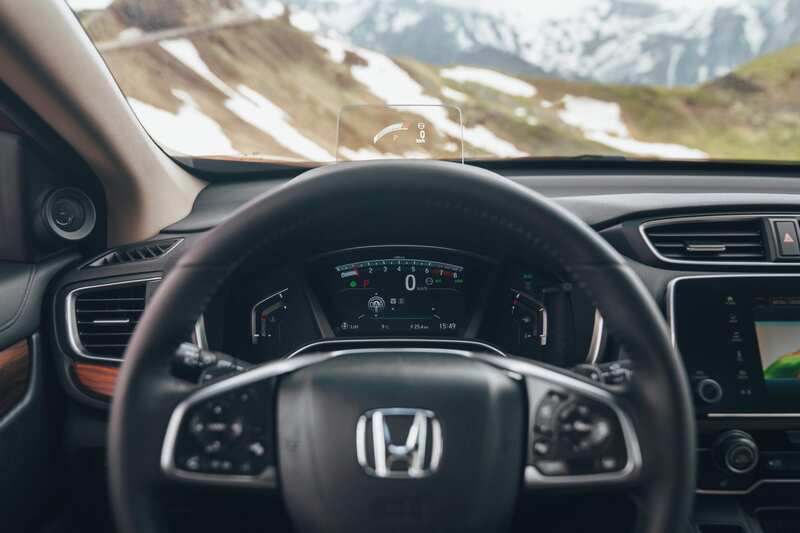 However, Honda’s latest all-wheel drive technology, which it calls the ‘Real Time AWD with Intelligent Control System’, is calibrated to deliver the optimum fuel efficiency and driveability. It supports the front axle for smooth and efficient driving, even in everyday conditions, such as directing power to the rear wheels, when starting from standstill. The 4×4 system employs a multi-plate clutch that connects a prop-shaft to the rear differential that is operated by an electric motor driving an hydraulic pump. It is a lightweight and fuel-efficient design that provides an optimal level of performance, with increased capability and security both on- and off-road, without factoring-in unnecessary weight to the drive-train. When torque transfer to the rear wheels is no longer required, such as during high-speed cruising, the prop-shaft is decoupled to reduce mechanical drag. Software updates to the AWD system result in the ability send up to 60% of torque to the rear wheels on demand, as well as an overall increase in torque through the system. The result is improved performance in low-traction conditions, as well as greater responsiveness and better hill-climbing performance in adverse conditions. The system also provides better dynamic cornering performance, through feedback from the yaw-rate and steering sensors, in addition to the linear control of the actuator. Largely inobtrusive, driver intervention is not required and responses at the helm are as benign as the car’s overall balanced handling. Naturally, safety was also central to Honda’s thinking for the new CR-V and its sturdy bodyshell is packed with Honda Sensing systems. Apart from crash mitigation, in both braking and front and rear collision monitoring, there is lane-keep assistance, adaptive cruise control, road signs recognition, vehicle speed and blind-spot monitoring, cross-traffic sensors and a multi-view rear camera system. Only one engine features in the car, a 1.5-litre displacement four-cylinder that delivers a healthy 173bhp in either front, or AWD manual forms. However, opt for the CVT automatic system and the power is hiked to 193bhp by way of compensation for possible transmission power losses. A top speed of around 130mph is promised for the less potent unit, while the CVT version is stated as 124mph, with 0-60mph being covered in around 9.2s (CVT: 10.0s). Recorded under the new WLTP regime, the Combined CO2 rating ranges from 143 to 162g/km, while the Combined fuel economy is given as 44.8 to 39.8mpg. 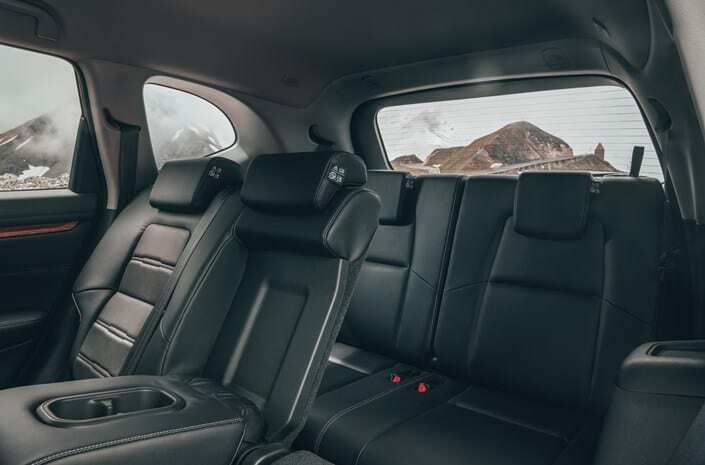 The longer wheelbase that allows seven seats to be installed, also enables a reduced boot space (150-litres), when all seats are occupied. 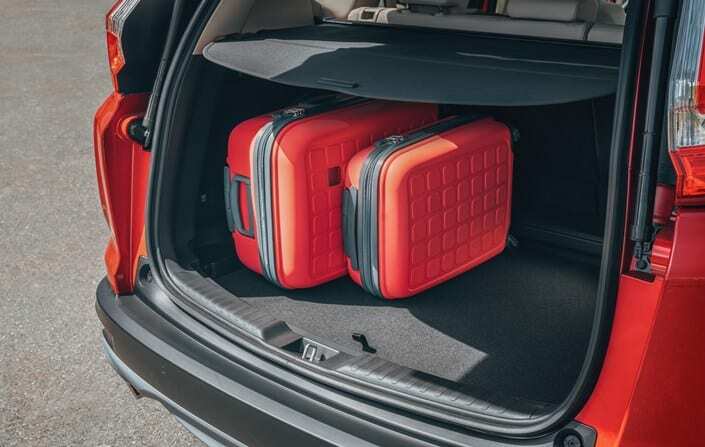 With the rear seats stashed, the boot offers 472-litres of luggage carrying capacity (up to the window-line), with 1,123-litres available, when the middle row is folded forwards. While the car’s silhouette is familiar, broader wheel-arches and sharper contours for the bonnet and rear quarters create a more modern, functional and dynamic outline. A larger wheel-and-tyre combination, coupled with a short rear overhang and dual exhaust tailpipes, enhance the athletic impact of the CR-V. Bold nasal design incorporates the solid wing graphic and signature headlight shape, while LED illumination is standard. Cleaner surfacing overall leads the eye from a flush-mounted windscreen and a smooth rearwards flow to the tailgate spoiler. Broader rear haunches enhance a greater dynamic stance and a more integrated and sportier shape overall. Sharply sculpted LED tail-light clusters create an L-shaped graphic on either side that contains the rear window glass. Customers can choose from eight exterior colours and alloy wheels are available in 17.0, 18.0 and 19.0-inch diameters, dependent on specification, while top-spec cars are equipped with a panoramic glass sunroof as standard. Prior to inevitable dealership discounts being applied, prices range from £25,995 to £36,455. Conclusion: Honda remains a much-loved brand in the UK market, even in an atmosphere of tumbling sales, an aspect aided immeasurably by its strong Anglophile appeal. First-class dynamics and a great reputation for dependability have been long-held Honda strengths that the latest versions of the CR-V merely highlight in significantly enhanced packages. This one can do well…given the opportunity.